Is Gold Poised For A Bullish Reversal? Momentum appears to be building for Gold, as a strong bullish move in yesterday’s trading session has taken the asset towards a previous market top at the 1292 price level. The 20-period exponential moving average (EMA) continues to play the role of support for the metal and currently has a sharp upward trajectory. There are however, signs that the momentum may not be sustained. RSI is heading towards the 70 overbought lines which when previous reached, has resulted in a bearish retracement. This, coupled with the fact that the 1292 price level has been a significant resistance level twice previously, suggests that there is a potential bullish reversal if price action hits the 1292 price level for a third time. Unsurprisingly, given the trajectory of Gold prices, the Eurodollar appears to be reaching close to a recent market top. Price action is approaching the first resistance line at the 1.81 price level, with the 20-period EMA acting as support. Volume has also been rising into the move suggesting an increasing interest in the pair. However, RSI is fast approaching the 70 oversold zone, which has acted as a resistance level for price action previously. Similarly, MACD suggests that momentum has turned more bearish and that the previously bullish trend is beginning to decelerate. Impact event: ECB Monetary Policy meeting at 14:30 GMT+3 will impact all Euro pairs. 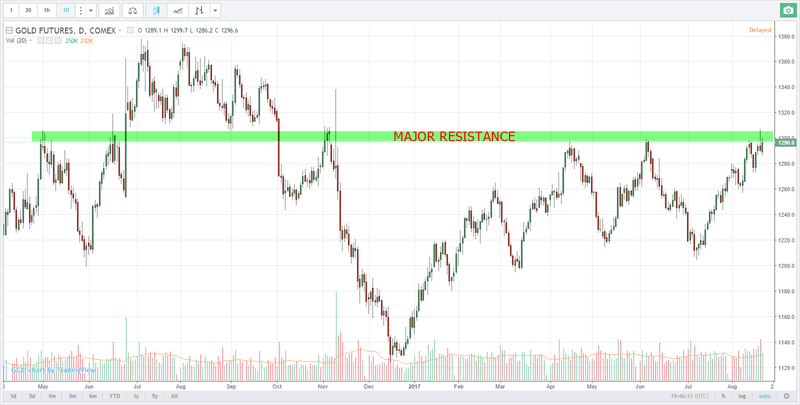 The AUD/USD chart shows that the pair has recently broken the 20- period EMA with a strong bullish candle and that price action has continued to rise above the the moving average. MACD remains in positive territory and RSI has an upward trajectory. Price action is heading towards a strong resistance area at the 0.800 price level. Rising volume indicates that Australian dollar buyers are dominating price action, especially during the last few trading sessions. Long term momentum will be determined by the pair’s ability to break the 0.800 price level. Therefore, the resistance level is significant. Silver prices were driven by strong bullish sentiment for the metal in yesterday’s trading session. Price action bounced off the 20-period EMA to break the resistance line at the 16.79 price level. The pair is now testing the 17.05 price level and a break of this line provides confirmation of the uptrend. The next price target will be the 17.69 price level which represents a previous market top. MACD is moving further into positive territory, yet RSI has flattened just below the overbought zone at 70. A strong break of (candle closing above) the 17.05 is required to confirm a direction for the pair. Its already made a U-turn now it heads for $1300 breakthrough. If fundamentals arrange in a favorable way, especially geopolitical tensions skyrocket again and Fed signals additional dovishness on planned timeframe for rate hike then it should renew peak-by-peak in medium term I guess. – which will have to be breached decisively, before a bullish case can be made. Gold primarily moves off real interest rates (interest rates minus inflation) and expectations over future real rates. Even though inflationary pressures remain muted, the market seems to be looking for higher rates in the future. Especially if we remain in a risk-on environment. I look for gold to break lower, especially once the dollar finds a bottom. Could be a take profit move by nervous guys as big events are ahead (Jackson Hole as mentioned before). Or SL test to show serious intentions to extend rally. What I like in this type of debates that contradictory views can be excellently applied, equally reasonable.